Register Log In ECN Forum Forums Violation Photo Forum Recent Rewiring Job? What can you find wrong here? It looks like the corroded box is outside or has been (or is) in a wet location...no cover. Furthermore, it probably isn't grounded, although it's hard to tell from the picture. What immediately jumps out at me though, is the single conductor (besides the ground) emerging from the left-most conduit. A real no no. On closer examination of the picture, I DO see an additional black wire ....so nevermind about the single conductor. This junction box was in a damp location that was actually about 75 feet away from the open area outside. It was located near the pool, and the hot humid weather in Florida could have added to the misery and corrosion here. 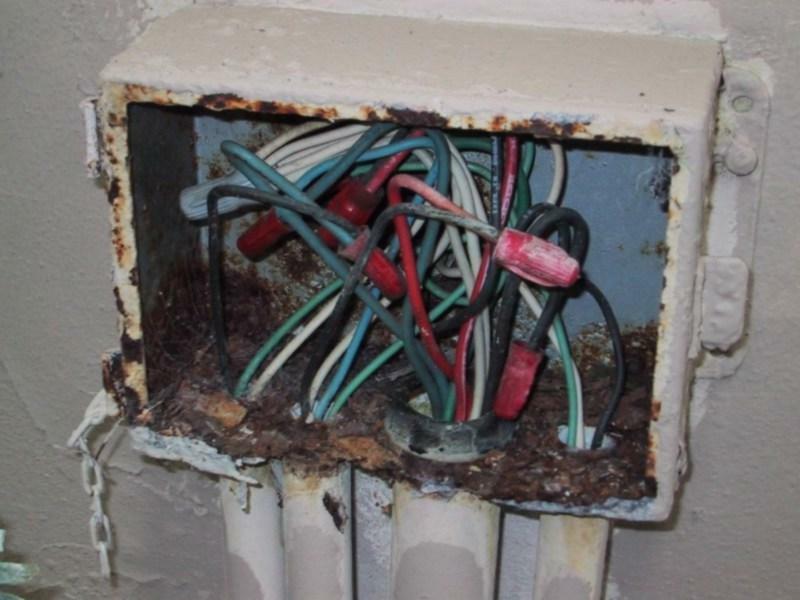 In NJ the electrical inspector has to look at every public pool each years for visable violations before a pool can open. Plus the public pool needs a pool bonding and grounding inspection certificate that is good for 5 years. If the public pool does not get them than they can not open up their pools for that year. What kind of testing is done to validate the bonding? I mean, what is the procedure, do you know? This is horrible, I've seen this many times. I used to work at a car wash and all the boxes were so rusted and the outlets were rusted to. The whole wash was always wet inside, and only one outlet was GFCI protected. It was sad. Hello, I am new to the fourm but visit it often. Besides the box being rusty another problem is the way they tied all the neutrals together on those multi-wire circuits. I always get confused when I see all of the neutrals under one wirenut. It appears there are multiple circuits.